Even after the “running boom” of the 1970’s, it was so highly unusual to be running at age 73 that Leatherman may have been the only member of the Steeplechasers that old and he was the subject of a nationwide study of senior athletes. 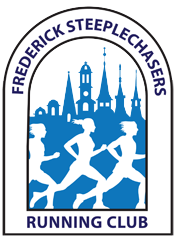 Fast forward 32 years from the article and the Frederick Steeplechasers roster contains twenty-one (21) runners over the age of seventy. Certainly the area and the club have experienced growth but a twenty-fold increase represents a sea-change in perceptions of aging and fitness. 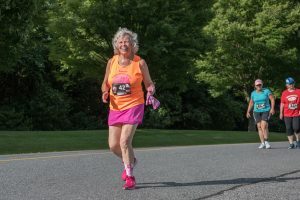 It’s funny,” says long-time Steeplechaser Leslie Nuse, “I knew Don Leatherman and thought how great it was that he was running at that age, and here I am at 72 and still running.” Leslie was roughly 37 years old when she started running. Her initial goal was to win a trophy in the Steeplechasers series of 2-mile “Run for Your Life” events. Subsequently, she has run under 4:00 for the marathon and completed the JFK 50 Mile Run. Leslie is not alone at arriving to the sport late and staying long. 71 year-old Allie Young started running 35 years ago to help her husband train for a U.S. Army “PT” test. She tells how her husband was transferred to Panama and meeting a group of women on base. “The ladies were running three to five miles so I increased my mileage,” explains Allie. “Panama is where I really got hooked on running. When we came back stateside, my husband retired and burned his PT clothes and his running shoes. I kept on running.” She counts among her most memorable running experiences a Boston Marathon finish. Rich Potter began running at 42 years old and is still at it nearly 30 years later. 81-year old Ed Chaney ran in high school, but took a long time off. 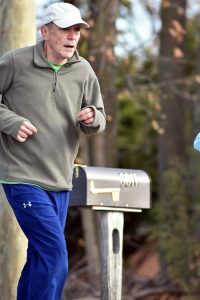 He returned to run his first 5K in 2001 at age 65. Likewise, 86-year old Don Taylor began running as a school-child in the United Kingdom and continued sporadically. When time and his career permitted, he burst on the running scene completing the 50-State Marathon Challenge and continuing to race almost without interruption. Perhaps the one chain of running excellence extending unbroken over sixty years belongs to Don Boyer. Don began running on the Frederick High School track team and earned a scholarship to race for the University of Maryland. In 1963, he was part of a Terrapin’s team that won an Atlantic Coast Conference relay championship. The dominance of those teams is often overlooked. The University of Maryland Track & Field Team won ACC championships, indoors and out, every year from 1956 until 1979. Following college, Don competed each year in both track and road events. 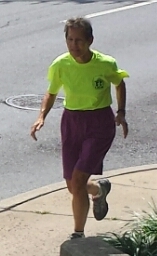 Now, 74 and legally blind, Don continues to compete in Masters Track & Field events. Postscript: Don Leatherman passed away on November 24, 2005 in Bozeman, Montana at the age of 93. He was a competitive runner and swimmer, a church soloist, and veteran of World War II.